The last decade of the twentieth century was the most difficult period for the press in Sierra Leone. This period was also characterized by deteriorating economic conditions, military coups d'état, violent political upheavals, and widespread illiteracy (approximately 70 percent). According to the Corporate Council on Africa study released in 2002, 88 percent of the country's rural population and 74 percent of the urban population lived in poverty. In 1991, civil war broke out and lasted for 10 years. By the time the war ended in January 2001, the country was in total ruin economically with a gross national product per capita of US $140 and nearly 1 million people classified either as refugees or internally displaced. By 2000, Sierra Leone was not only considered the poorest country in the world, it was also the most dangerous place for journalistic practice. Between 1999 and 2000, 10 journalists, including 2 foreign reporters, were killed and the United States-based Committee for the Protection of Journalists (CPJ) named Corporal Foday Sankoh, the leader of the rebel group Revolutionary United Front (RUF), one of the 10 worst enemies of the press in the world. Yet, strangely, it was during this same period that the press survived against the worst odds and flourished dramatically. 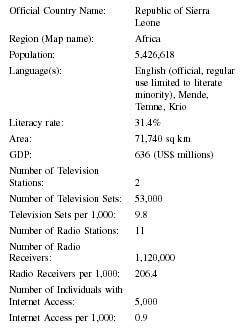 In 1990, for example, there were fewer than 10 regular newspapers in the country, and only the government operated Sierra Leone Broadcasting Service (SLBS-TV and Radio) dominated the airwaves. In 2002, despite the previous decade's difficulties, there were over 60 newspapers and about 12 radio stations catering to audiences across the country. Although government still operates the only television station in the country, Sierra Leonean viewers seem to have unfettered access to international television programs from giant broadcasters such as the British Broadcasting Corporation (BBC), the Voice of America (VOA), International Television Network (ITN) and Cable News Network (CNN), which beam their programs into the country via a network of satellite systems. However, one of the most enduring and intractable problems for the local media lies in the ethnic and religious diversities of this West African country of some 5 million people with more than 15 different dialects and languages. Sixty percent of the population is Muslim, 30 percent hold on to indigenous beliefs, and the remaining 10 percent practice Christianity. Without exception, Sierra Leonean newspapers are published in English, yet only approximately 30 percent of the population are fluent in this language. Even today, radio and television programs are mainly in English, although some stations are making serious efforts to address this linguistic divide by increasing the number of hours of programming in the local languages. The net effect of this is that media practitioners generally are forced to direct their messages to a national audience without regard for ethnicity. The end of the civil war was officially declared in January 2001, and democratic elections were conducted in the country in March 2002. With an improved security environment and the unfolding democratization processes, media practitioners now revel in their newfound freedoms, especially the unprecedented freedom to publish or to broadcast without much fear. The first newspaper in West Africa, the Sierra Leone Gazette , was established in Sierra Leone in 1801. For over 50 years after the founding of the Sierra Leone Gazette , European settlers controlled and dominated the newspaper business in Sierra Leone. In 1855, William Drape established the New Era , the first indigenous African newspaper in Sierra Leone, and perhaps in West Africa. Drape did not only set the tone and standard for journalism in West Africa, but also helped redefine government-press relationship during the 1850s and onward. His legal troubles with the colonial government set a major precedent in defining the limits of political power over newspapers, first in Sierra Leone, and then in the West African subregion. In the dawn of political independence, political activity intensified, and political parties started to emerge. This new era gave rise to a new kind of journalism and a new genre of the newspaper establishments—the political party newspapers. The first such newspaper established in 1945 by the Sierra Leone People's Party (SLPP) was the Bo Observer; the United Progressive Party (UPP)established Shekpendeh in 1954; and the All People's Congress (APC) established We Yone in 1963. Throughout the 1990s Sierra Leone was classified as one of the poorest countries in the world, and by the end of the twentieth century it was classified as the poorest for three consecutive years. This depressing economic condition had a severe impact on the press and media activities in the country. Advertising revenues could not adequately support newspapers, and dilapidated printing equipment, poor infrastructure, and extremely limited distribution systems hampered the spread of media activities in the country. Hence, although the number of media outlets multiplied, the newspaper industry was dominated by sole proprietorships and establishments run by a handful of individuals. In 2002, there were no daily newspapers in Sierra Leone due to financial constraints. With limited resources and sometimes because of stringent foreign exchange problems, newspaper proprietors find the cost of newsprint highly prohibitive. Faced with this kind of financial constraint, the average publication consists of an 8-page tabloid with circulation limited primarily to Freetown, the capital city. The average circulation is about 6,000, and there is intense competition among the various papers as they vie for the attention of the same limited pool of urban elite readers mainly residing in Freetown. Although most of the papers are privately owned, a number are either political party publications or have some political leanings. Despite these limitations, newspapers remain a force to be reckoned with in shaping the climate of public opinion in Sierra Leone. Between 1980 and 2000, numerous measures designed to place strict controls on the press were formulated, especially when state governance was based on one-party dictatorial principles. These measures included state monopoly, prosecutions for libel or seditious libel, taxation, and bonding. The extant press regulations in Sierra Leone are either remnants of colonial policy or inspired by discarded British colonial libel laws of the early twentieth century, such as the Newspapers Ordinance of 1924 and the Undesirable Publications Ordinance of 1939. Until recently, the broadcast media (i.e., radio and television broadcasting) were state monopolies in Sierra Leone. Private citizens were prohibited from owning or operating any form of the electronic media. State monopoly over radio and television broadcasting remained until 2000 when the Independent Media Commission (IMC) was established and provisions were made for the privatization of the broadcast media. During the war years of the 1990s, an astounding number of journalists encountered trouble with the government. Many journalists affiliated with independent newspapers were frequently detained, harassed, or imprisoned on charges of libel or seditious libel. In Sierra Leone, no special tax is levied on newspaper proprietors, but they are required to ensure that media workers pay taxes on their income. Although this applies to all business enterprises in the country, the tax requirement has been a bone of contention between government authorities and newspaper proprietors who interpret the regulation as a veiled attempt to stifle their activities. Bonding required proprietors of newspapers to post large sums of money before they were permitted to publish their papers. Besides registration fees, newspapers were required to post a collateral of US $4,000. With persistent public complaints against newspapers, government authorities claimed that the main aim of this stipulation was to ensure that if charges of libel were brought against a newspaper, the collateral would provide some relief for the plaintiff. IMC is charged with the responsibility of promoting a free and pluralistic media throughout Sierra Leone and to ensure that media institutions achieve the highest level of efficiency in providing media services. The relationship between the state and the press in Sierra Leone has seldom been amicable as media practitioners and political power holders harbor mutual suspicion. Reports about rampart corruption and mismanagement in government are the staple content of the media in Sierra Leone. On the other hand, government officials often react to such reports by using public outcry against journalists for professional misconduct and the lack of professional training as warrants for the formulation of restrictive press laws and regulations The relationship fell to its lowest in the 1990s when various warring factions blacklisted and systematically targeted certain journalists. During this period many journalists were killed or incarcerated, and at least one died in government custody. But multiparty politics and the democratization processes have brought about renewed hopes for the press as government authorities no longer insist upon enforcing these press regulations to the letter. Local journalists often complain that their government gives better treatment to foreign journalists than they receive. To some extent, that may be true. What is also true is that foreign correspondents come with more clout and generally have well-established reputations than local journalists. But most important, they also have more resources that allow them to go to places that remain beyond the scope of their local counterparts. In the war years, most of the major stories and serious investigative reports were done by foreign correspondents that brought the Sierra Leone crisis to the attention of the international community. Foreign correspondents had numerous exclusive interviews with government officials as well as with rebel leaders and other key players. Few Sierra Leonean journalists were granted such opportunities. In addition, most foreign correspondents come from aid donor countries such as Britain, United States, and Canada and are often associated with international press organizations such as the CPJ and Canada-based International Freedom of Expression Exchange (IFEX). The Sierra Leone News Agency (SLENA) was established in 1987 as a means of facilitating greater circulation of information and news within the country and with the outside world. SLENA has four branches around the country, and it is sometimes linked via satellite with other international news agencies such as Agence France Presse, the Pan African News Agency, Xhinua (China News Agency), Associated Press, and Reuters. The agency also publishes a twice-weekly newspaper, Sierra News , for its subscribers and public readership. Although a government agency, SLENA enjoys a level of independence in carrying out its mandate as a national news agency. Radio and television broadcasting operated under a state monopoly from the time radio broadcasting started in 1934 and television in 1964 until the late 1990s. With the establishment of the IMC, radio and television broadcasting were opened to private ownership. Thus, the air-waves now carry a diversity of voices including government, private citizens, and religious groups as well as programming from international broadcast organizations such as the BBC and the VOA. As a result of privatization, there are now some 12 radio stations in the country compared to the one or two that existed during the 1980s. The Internet is still at a very low level of development in Sierra Leone, and it is not as widespread as it is in some other African countries. 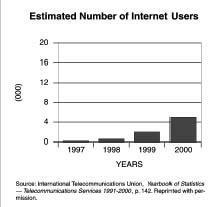 Only 5 of the nearly 60 newspapers or so have established an Internet or World Wide Web presence. These include the Concord Times ( http://ww.oe-pages.com/BEZ/Homebiz/tod/ ), Expo Times ( http://ww.expotimes.net/ ), Pool Newspaper ( http://ww.poolnewspaper.tripod.com/hompage.html ), and Sierra News ( http://ww.sierra-leone.gov.sl/slnewspages.htm ). Sierra Leone, the pioneer country of West African journalism, did not have a program for training media practitioners until 1993. The Ministry of Information trained government public information officers, but others seeking to become media practitioners went to other African countries, North America, or Europe. In 1993, following numerous and persistent requests from both media practitioners and the public, the University of Sierra Leone established a Mass Communications Unit at Fourah Bay College to train journalists and other media personnel in the fundamentals of mass communication. Within the first nine years of its existence, the program produced over 30 graduates, who are now employed by local newspapers, radio and television stations. Major factors that will continue to influence the press and the growth of the media in general include the democratization processes, civil society, technological innovations, improved economic conditions, peace, and stability. With the civil war over and a seemingly improved security environment prevailing, the number of media outlets including newspapers and radio stations will continue to rise, and media activities are bound to spread to other parts of the country in the years ahead. 1993: Fourah Bay College, the University of Sierra Leone, established a Mass Communication program for the training of journalists as part of its curriculum. 1998: Five journalists are sentenced to death for collaborating with the military junta that overthrew the government of President Ahmad Tejan Kabbah. 1999: Associated Press reporter Myles Tierney is shot to death in Freetown by Revolutionary United Front (RUF) rebels; the five imprisoned journalists are freed by RUF rebels. 2000: The Independent Media Commission is established with provisions for the privatization of the broadcast media; Corporal Foday Sankoh is named one of the world's 10 worst enemies of the press; Reuters War Correspondent Kurt Schork is shot and killed in Sierra Leone. Corporate Council on Africa. Africa 2002 . New Canaan, Connecticut: Business Books International, 2002. Holmes, Patricia A. Broadcasting in Sierra Leone . Lanham: University Press of America, 1999. Kaplan, I. et al. Area Handbook for Sierra Leone . Washington, DC: American University Press, 1976. M'Bayo, Ritchard T., and M. Mogekwu. "Political Authority and the Transformation of the Sierra Leone Press." In Press and Politics in Africa , ed. R. M'Bayo, C. Onwumechili, and R. Nwanko, 107-28. New York: Mellen Press, 2000. Omu, Fred I. A. Press and Politics in Nigeria 1880-1937 . Atlantic Highlands, NJ: Humanities Press, 1978. It's so good to give right to media house and the fourth Arm of Government because it directly affect the lives of the general public and must operate responsibly and independently towards the development and benefit of all.Thanks for bring net coverage on sierra leone. I wish to congratulate the Sierra Leone media for the ongoing work towards national development. Keep the good work and save our only sweet mother land mama Salone . From Rev. Ibrahim Momoh Mansaray . Ghana. Amidst all the problems faced by our journalists in Sierra Leone, they are still striving to make our country a better place,thanks guys. Life can be recircle if you want it to be. Sierra Leone press (print and electronic) had gone through this hell still on your tose, i like people like you keep it up and always be yourself. The only thing is that your guys needs to investigate their datas well before converted them to information. Hello! How are you? I am very much interested in your programming. Pls I need to knw all the radio stations and managers operating in Sierra Leone. I have just read the piece on the Media in Sierra Leone, rather, Freetown. I am saddened, embarrassed and shocked that despite Long years, and the presence of " Media Training Bodies" in Freetown, the standard and quality is woefully shocking; sub-standard, poor. It is a phenomenon that all Sierra Leoneans should be ashamed of.